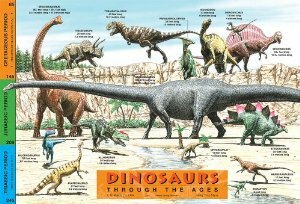 Wonderfully illustrated 2-sided placemat featuring T-Rex, Iguanodon, Seismosaurus, Spinosaurus, Allosaurus, and 10 others and their respective lengths. The back is a black & white illustration of the front. Tags: allosaurus, color, iguandodon, illustration, markers, placemat, seismosaurus, spinosaurus, decor, room.